Charles Darwin said humans descended from monkeys. Darwin coined the term “survival of the fittest.” Darwin was the first person to theorize evolution as the origin of species. Darwin did not believe in God. Darwin played shortstop for the New York Yankees. These are just few of the common myths that are associated with Charles Darwin. (Well, maybe not playing for the Yankees.) But, as with the Yankees myth we just created, the rest are also all false. Here is the truth about a few of the Darwin myths so prevalently repeated. Myth #1. Charles Darwin said humans descended from monkeys. Analogy would lead me one step further, namely, to believe that all animals and plants have descended from one prototype. But analogy would be a deceitful guide. Nevertheless, all living things have much in common, in their chemical composition, their germinal vesicles, their cellular structure, their laws of growth and reproduction. Darwin’s main musing here was that all living things perhaps descended from one thing, including humans and monkeys. More to the point, he believed that humans and monkeys came from a common ancestor, with humans and monkeys having something more akin to a cousin relationship, than a parent/child one. All that being said, we now know that humans are more directly related to apes. In fact, humans and apes have more common, gene pool-wise, than monkeys and apes. Myth #2. Darwin was an unknown scientist before On the Origin of Species. 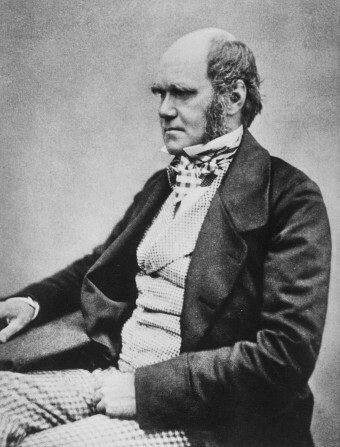 Darwin’s On the Origin of Species struck a chord when it was released in late 1859. But prior to that, he was already well respected in the scientific community. Peers described him as an “accomplished naturalist” (from Andrew Murray’s 1860 review of the book) and “ANY contribution to our Natural History literature from the pen of Mr. C. Darwin is certain to command attention” (Samuel Wilberforce, 1860). There’s a reason all 1,250 copies of the first print of On the Origin of Species sold the first day. It was as early as 1836 that Darwin started getting attention for his work when his mentor, John Stevens Henslow, started telling others of Darwin’s studies. Darwin wrote many books and pamphlets prior to On the Origin of Species, including Journals and Remarks published in 1839 (basically a memoir about his Beagle travels) and The Structure and Distribution of Coral Reefs (a much more narrow writing about coral reefs). While they weren’t as highly read nor as revolutionary as his more well-known works, they were thought of as scientifically significant within the community and helped establish his reputation. Myth #3. Darwin was the first to publish a book about evolution. Despite the common misconception that Darwin is solely responsible for discovering evolution, that is not the case. The idea of evolutionary biology was not by any means a new one, with theories that touch on evolution going all the way back to at least the 7th century BC. Much more recently, in the early 19th century, there was a very popular theory of evolution proposed by Catholic scientist Jean-Baptiste Lamarck. However, Darwin took a slightly different approach than Lamarck, suggesting that entirely different species could share a common ancestor, a so-called branching model, rather than a “ladder” model that was so popular in some scientific circles before. In another example, fifteen years prior to Darwin’s published work, building somewhat on Lamarck’s work, there was Robert Chambers’ Vestiges of the Natural History of Creation. Published in 1844 originally anonymously, it talked of ideas like “stellar evolution” – that stars change over time – and “transmutation,” that species change from one form to another. In my opinion it has done excellent service in this country in calling attention to the subject, in removing prejudice, and in thus preparing the ground for the reception of analogous views. Myth #4. Scientists across the world largely dismissed Darwin’s theories initially. I have called this principle, by which each slight variation, if useful, is preserved, by the term Natural Selection, in order to mark its relation to man’s power of selection. But the expression often used by Mr. Herbert Spencer of the Survival of the Fittest is more accurate, and is sometimes equally convenient. Myth #6. Darwin was an atheist. Confronted with these questions while he was still living, he passionately denied being an atheist in correspondence, letters, and even his own autobiography. Instead, he said, “I have never been an atheist in the sense of denying the existence of a God. – I think that generally … an agnostic would be the most correct description of my state of mind.” As a scientist, he was smart enough to know not to draw conclusions when the data was lacking. In that same letter, he also admits that his “judgement fluctuates.” Even one of the greatest scientists in history was flummoxed by the question of God and a greater presence. There is also a myth out there that he recanted evolution on his deathbed and “returned” to Christianity. This is not true and, beyond creating a dichotomy where one didn’t necessarily exist in Darwin’s mind, has been denied several times by Darwin’s descendants. To Darwin, religion and evolution weren’t mutually exclusive. This brings us to our final myth. Myth #7: From the beginning, it has been almost universally evolution vs. creation. [God] created beings and allowed them to develop according to the internal laws that he gave to each one, so that they were able to develop and to arrive and their fullness of being. He gave autonomy to the beings of the universe at the same time at which he assured them of his continuous presence, giving being to every reality. And so creation continued for centuries and centuries, millennia and millennia, until it became which we know today, precisely because God is not a demiurge or a magician, but the creator who gives being to all things… The Big Bang, which nowadays is posited as the origin of the world, does not contradict the divine act of creating, but rather requires it. The evolution of nature does not contrast with the notion of creation, as evolution presupposes the creation of beings that evolve. 1. Most of the organs and tissues in the human (or other animal’s) body function as part of a system. How did they evolve separately? The heart would provide no advantage without the lungs, vessels and arteries, likewise the intestines are worthless without the stomach, the eardrum useless without the hearing centers in the brain, etc etc. So these could not have come about as a result of random mutations unless each system of parts mutated into existence all at once, or each part was selected by itself even though it provided no advantage when it formed before the other parts of the system. 2. If animals exist in breeding populations but for the most part all species are uniform in major characteristics (head, liver, stomach, etc), how did all of these characteristics jump from one breeding population to another? Each change would require that every organism in that species eventually be a descendant of the organism in which the change occurred in order for the change to “stick”. And most species share the same major organ systems and other body parts. This would mean all the evolution that produced the brain, heart, lungs, feet, hands, etc would have to have happened in one small population of some organism, then all the evolution to diversify species would have to happen, and then there would have to be no more major changes to body structure either during this differentiation of species or over the ensuing millenia. There is also the fact that a bird’s feathers, hollow bones, etc. would be useless without the instincts that tell them how to fly. And the fact that none of this explains the great diversity of stationary trees and plants. As far as why are there still monkeys, I think it is a valid point considering Darwin thought “SURVIVAL of the fittest” was a succinct way to describe his theory. The way evolution happens is supposed to be for more fit species to survive and less fit to die. If they all survive then it’s not survival of the fittest. Evolution is maybe the start of a interesting theory of nature. But it’s pretty far from an explanation of the origin of all of the species on Earth. grab a high school book and read chapter evolution cause buddy u did not GET IT RIGHT!!! The Bible says God created Adam, and from one of Adams ribs Eve. Since that is the truth, and they were created to be human, and in the image of God, complete in every way, how can you say survivle of the fitest could even happen. God created man to be pefect, and they were until they ate from the tree of knowledge. So where does that leave room for evaloution? @Anita Harris: It does say that about Adam and Eve, though the rib part is a bit of a mistranslation as we’ve written about previously here. And one could argue about the “perfect” part, merely free from the knowledge of good and evil until the fruit was eaten. Hence, they could not sin other than by eating the fruit, as that was the only restriction laid before them and sin by its very definition is simply going against God’s will; at that point, they only knew one thing that God did not want them to do and were oblivious to good and evil otherwise. If they were truly perfect, presumably they would not have eaten the fruit, knowing their creator told them not to. But getting back on track, this doesn’t necessarily say how exactly creation was achieved. This is the reason why the Pope, and others, say it doesn’t conflict with the Bible. In fact, the order of events doesn’t even conflict (necessarily)- plant life, sea-life/flying animals, land animals, man. There’s also the fact that Cain went off and lived with other humans. The Bible does not explain where these came from. It’s also not clear how long these 7 “days” (some think better translated as “events”) took. And, of course, if you go by the Biblical dating, Adam and Eve lived only about 6K years ago. So, if you’re assuming the Bible is completely correct and complete on the creation story, either Adam and Eve were created very recently in history, long after other humans, or there is a lot of missing information. Then there’s also considering what would have been easier- explaining to humans several thousand years ago about the intricacies of evolution and genetics and having them include all that, or just saying “created”? Considering I think most Christians don’t think God was trying to have authored a science text, rather a religious guide, in the works included in the Bible, no real point in including such details. Whatever you believe about it, you can see why many Christians through the theory of evolution being presented up until the last century or so, and the Catholics from the beginning, have had no major problem with evolution. Even for those who did have a problem with it historically, the key sticking point was generally just the whole 6K years thing, but few really find that much of an issue any more. For most today, the problem is more the fact that they were taught it was incorrect, with a lot of confirmation bias thrown in over the years. We humans are notoriously bad at changing our thinking, especially when something is taught as a child and believed for many years after, even in the face of overwhelming evidence. God himself in all his glory could say from a booming voice in a blinding cloud in the sky, heard and seen all around the world at the same time, that evolution is how man came to be, and there would be a not insignificant number of Christians who would then simply reject that it was God. Thank you. All this time I thought I was the only one. Tell me how all manners of creature can breed abundantly on earth and be fruitful without some form of adaptation. Also from man sinned and was cursed (my scientific equivalent: mutated). It sounds crazy but isn’t completely groundless. Hear me out. Our somatic cells (the cells that are part of our body) suffer occasional mutations as they divide. These mutations can kill or damage cells, which is annoying but not generally a big problem as we can make more. However, the worst mutations do something much more dangerous: they help cells to survive and proliferate. That’s how you get cancer. Because this risk accumulates over time, cells are normally allowed only a limited number of divisions before they undergo cellular senescence, that is, they die. But the genes that cause cellular senescence can also stop working. So that’s one of the ways in which we get old: our somatic cell lineages get older, damaged and mutated, and some become cancerous. the surface of knowledge pertaining to immortal cells, all my cell cultures keep dying when I 3d print them before I can get proper effin Angiogenesis) Sorry for that last blurb. but yeah, plenty of room left for evolution, and devolution, because sometimes our cells just eff up and sometimes, the do some pretty cool adapting to compensate or fix it. Well, you are a theist who believes we are creations. First thing I want say is Sir Albert Einstein is a non believer of god. Most theist used him for promotion of their religion. A brilliant man will tell you when they don;t know. A fool will believe they are right when the are wrong, and a brilliant fool will be right and never know it.